Summary: The outback once more becomes a place of horror as another unwitting tourist becomes the prey for crazed, serial-killing pig-shooter Mick Taylor. The original Wolf Creek film stood out because it brought something new to the horror genre… which at the times was starting to get a little stale. Director Greg Mclean did something a little different with the film. Not only was it beautifully shot as it captured the beauty of the Australian outback but it also mixed a regular thriller style film with the true gory horror of something like Hostel or Saw. This time around though Mclean has decided to mess with the formula a little. Mclean seems to have taken on board some of the criticisms (albeit that some were completely unfair) of the first film and tried to fix that while also keeping to the horror genre rule that the sequel to a film always needs to be bigger and better than the first film. Whether that makes it better or not though… well that is another story again. 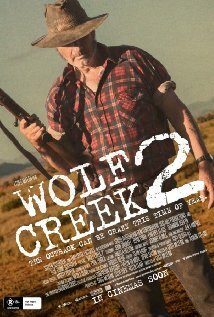 Wolf Creek 2 again sees the return of one of Australia’s most notorious serial killers, the brutal Mick Taylor (John Jarratt). This time Mick finds himself under the gun from scene one with Police Officer Senior Sergeant Gary Bulmer Jnr. (Shane Connor) trying to make life hell for them. Once he has overcome that little hurdle though Mick soon finds himself chasing backpackers again – in the form of Katarina Schmidt (Shannon Ashlyn) and Rutger Enqvist (Phillipe Klaus) although he again runs into trouble when meddling Englishman Paul Hammersmith (Ryan Corr) begins to get in the way of all his plans. This is kind of horror film that fans of the genre are either going to really love or really hate. Things such as giving Mick a bit of a comical edge is certainly going to divide fans. On one hand it does create a bit of a buffer for Mclean seeing that this time around we see a more sinister edge to Taylor but at the same time horror purists are certainly going to argue that it does hold the film back a bit. Perhaps the biggest thing that needs addressing with Wolf Creek 2 is that it feels like Mclean has almost made this three films in one. First of all it’s Mick vs The Cops, then it’s Mick vs The Germans and then lastly Mick vs Paul, and to be really honest the film doesn’t kick into top gear at all until the third storyline, especially when we finally get to see into Mick’s lair. Mclean it seems is also very proud to show off some of Australia’s rich film history with Wolf Creek 2. There is certainly some scenes that seem to pay tribute to some great Australia Ozploitation flicks such as Turkey Shoot or Fair Game while the car chases could have come straight out of any of the Mad Max films. But no chases featuring big rigs or CGI kangaroos is going to make up for the fact that for most of Wolf Creek 2 the story badly lets it down. When it comes to the acting Wolf Creek 2 certainly doesn’t test it’s cast too much. John Jarratt seems to handle the change of being an intense character with some comedy elements pretty well… but then what do you expect from an actor who over the years has done things as broad as hosting a Home And Gardens renovations show and also a kid’s show. The acting talents of Aussie greats like Shane Connor and Gerrard Kennedy seem wasted in their roles while Ryan Corr does his best to get noticed but even he isn’t given a massive amount to work with. There is no simple way to say it. Wolf Creek 2 is good but for very different reasons to the original Wolf Creek. Kudos to Greg Mclean for sticking to his guns and making a politically incorrect horror but purists of the genre should be warned that there may be one or two things that you don’t approve of. Other Subculture Media Reviews of ‘Wolf Creek 2′: Please check The Good The Bad The Ugly Film Show Ep #68 for our full Wolf Creek 2 review.